The second SkyHouse apartment tower in uptown Charlotte recently celebrated their grand opening. Charlotte staff members, David Peñalva, France Johnson and Alex Robinson, were in attendance to show our support. 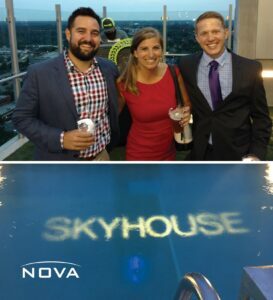 The SkyHouse brand is well represented with the impressive logo placement in the pool. Adjacent to the first 24-story tower, the second SkyHouse Uptown building is a mirror image. Both buildings have 336 apartments, totaling 672 high-end studio, one-, two- and three-bedroom units. They’re on North Church Street, between Ninth and Tenth streets. The buildings flank a parking deck that’s topped with a nearly 1-acre park (called SkyPark) with a tennis court, athletic fields, grilling stations, fire pits, putting green and bocce ball courts. This area is only open to SkyHouse residents. Another beautiful development were are proud to have worked on.